This content provides information to help you get started with System Center 2012 – Data Protection Manager (DPM). What is Data Protection Manager (DPM)? System Center 2012 – Data Protection Manager (DPM) is an enterprise backup system. Using DPM, you can back up (copy) data from a source location to a secondary target location. If the original data is unavailable because of planned or unexpected issues, you can restore the data from the secondary location. You can use DPM to back up application data from Microsoft servers and workloads, and to back up file data from servers and client computers. You can create full backups, incremental backups, differential backups, and bare-metal backups to completely restore a system. Before you install System Center 2012 – Data Protection Manager (DPM), make sure that the computer you use for your DPM server, and all the computers and applications you want to protect, meet or exceed the minimum hardware, software, and network requirements. The following is a summary of system requirements, with links to more information for each version. NOTE: Setup automatically installs these if they aren’t already installed. SQL instance For the DPM database, DPM requires a dedicated instance of the 64-bit version of SQL Server 2012, SQL Server 2008 R2, or SQL Server 2008 R2 SP1, Enterprise or Standard Edition. During setup, you can choose to have DPM Setup install SQL Server 2008 R2 on the DPM server, or you can specify that DPM use a remote instance of SQL Server. DPM isn’t supported on any version of Turkish language Windows Server. NOTE Setup automatically installs these if they aren’t already installed. DPM isn’t supported on the Turkish language version of any of the supported versions of Windows Server. Limitations You can install DPM on the operating system volume or on a different volume. DPM supports protection of various Microsoft and Non-Microsoft based workloads. The following resource contains detailed information about what kinds of workloads are supported. The information in this linked resource applies to System Center 2012 SP1 - Data Protection Manager, System Center 2012 - Data Protection Manager, and System Center 2012 R2 Data Protection Manager. There are a number of resources to help you ramp up on System Center 2012 – Data Protection Manager (DPM). 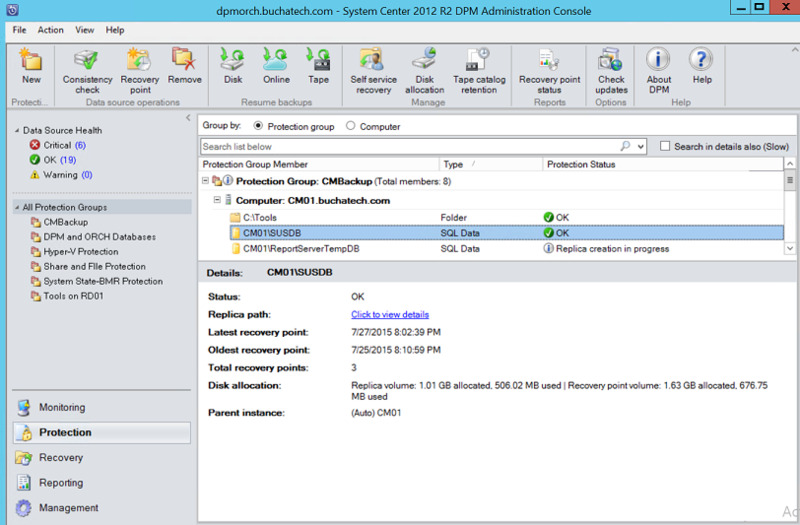 For evaluation material, see Microsoft System Center Data Protection Manager. For technical documentation, see System Center Data Protection Manager TechCenter. For troubleshooting and the latest DPM updates, search for “Data Protection Manager” in the Knowledge Base (KB). For questions and troubleshooting visit the DPM forum.